Today, I became a man. 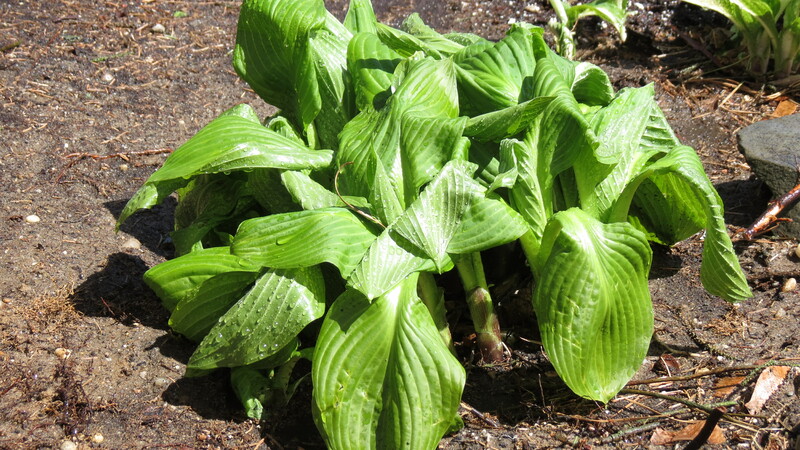 Today, I channeled my inner Schwarzenegger, and tackled a division of Hostas – or rather, Hosta division. The thought occurred to me that the Hostas in the front bed were getting quite large and needed to be divided. Actually, that thought occurred to me years ago –and Joe has reminded me of this each season. I always fell back on it’s just not the right time of year to divide – but the shelf life of that excuse was long exhausted. The truth is that I was terrified to divide them. For one thing, they were enormous and I dreaded the thought of hacking into them and making them smaller – although I knew that the task would result in more plants. For another thing, the Hostas were planted under a 40-foot Blue Spruce. I could remember when I planted them how difficult it was to dig through the roots of this monster tree – and I did not look forward to doing that again for the division. 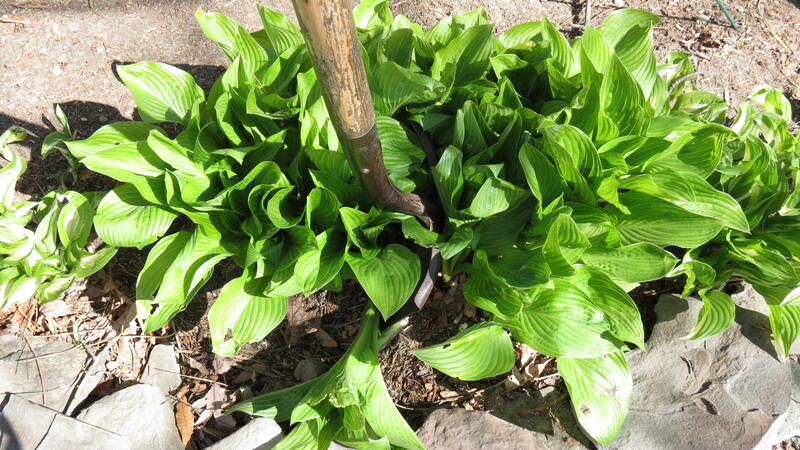 I was concerned that it would have to be a violent dig, and that would put too much shock on the Hostas – and I would be left with nothing, just some holes where living Hostas used to be. 1. 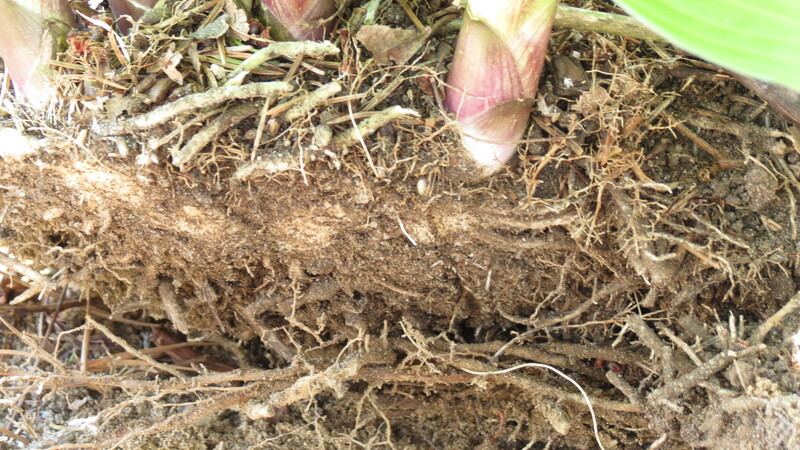 I began by digging around one side of the Hosta, the shovel cutting through the mat of Blue Spruce roots. Gently, I pried upward. 2. Carefully, I negotiated the tip of the spade through the Hosta shoots, and stepped down, slicing through the Hosta clump. 3. Eventually, half of the plant could be lifted and placed in its new location. 4. Then came the wilt. I wondered if this was how a surgeon felt after a difficult procedure on a patient. I kept checking back regularly, watering, and monitoring the progress of the newly planted Hostas. 5. Twenty-four hours later, Hostas and surgeon were doing well. Now that I had some muscle, I noticed the other perennials staring at me in awe — or was that fear? Funny post… I have that task on my list this week too, at least I’ll go into now with a smile! We need all the help we can get — and all of the smiles. Be strong! Hey Ahnie – at least it’s “not a tuhmour!” (Kindergarden Cop). Well done! Hosta division is a necessary but scary procedure. Be sure to put coffee grounds and egg shells around your new babies so the slugs don’t chew them up. You will really need muscle – and a chain saw – if you decide to divide grasses!! Now THAT’S scary! Very entertaining post, and yet informative, too. I’ve been doing some of that in my own beds, and I know it can be quite intimidating! Cindy, so glad you liked it. I’ve learned that it’s a combination of holding your breath and just digging in — so to speak. I never thought about how a surgeon might feel. I wonder if all patients go through a ‘wilting’ stage like plants! Good going on your hosta divisions. I’m sure they appreciate having a little wiggle room! I keep checking on them, and today I think they appreciated the overcast skies. I know I did. It gave me a good excuse to take care of some neglected indoor chores. I love your titles. So funny. If I lived close to you, I would come over and help you. I do this all the time and share plants with friends. Sounds like a plan! I think sharing is another one of those great things about gardening. Very entertaining post. It looks like you just came from a work-out in a gym. True enough, it takes a lot of muscles to do operating procedures sometimes. There’s no stopping you now! The hosta (s) look wonderful, I always struggle with the battle of the slugs, but we are re-doing parts of the garden this year and I’m going to try them again. Hostas truly are reliable. They come up year after year, and there is plenty of variety. I’m going to try the egg shells and coffee grounds tip to keep slugs away. LOL! Well it is full speed ahead now in plant dividing. You get more muscle and a little braver with each attempt and survival. LOL! Well done! Looking forward to the day when mine are big enough for division. Lets hope I’ll be able to do as good a job. Thanks for a thoroughly entertaining narrative Ahnold but I have to wonder if truth be told, has there ever been anyone who actually succeeded in killing a hosta, short of pouring a gallon of R/U or vinegar on it? 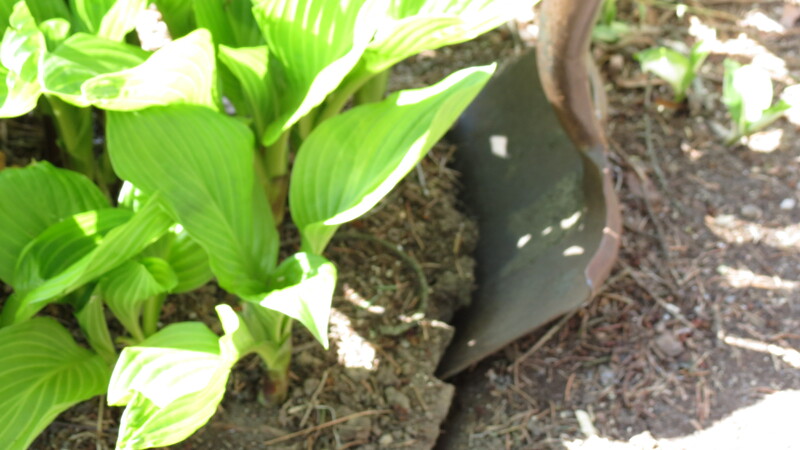 I have more than 30 “designer” hostas (including Empress Wu) carefully sited where they’ll never, ever need dividing. 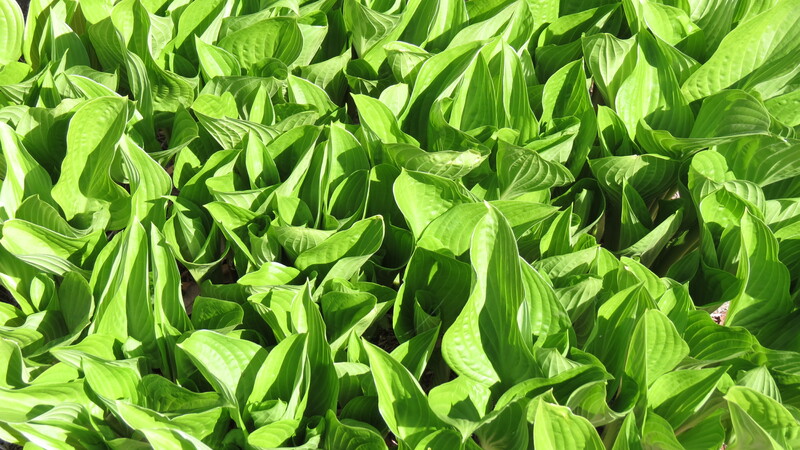 One that was mislabeled at the hosta nursery was divided–ruthlessly–last year, replanted where it can spread several feet in all directions, and the divisions rebounded within days of transplanting. Astrid ain’t lying–it’s ornamental grasses that’ll separate the body builders from the boys. She’s also right about the coffee grounds and crushed eggshells (i.e., you’ll be very glad you did). I’ll definitely try Astrid’s suggestion — and if you must know, I have known Hostas to die. I’m not sure if it was anything I did to them, but they did peter away. That’s why this division was so difficult. These particular Hostas were just the way I liked them — big and leafy and tropical looking. Thanks for commenting. I bet they were scared! Now do you want to come to Idaho and tackle irises? Mine need dividing big time, but I’m no Arnold Schwarzeneger (sp?). Kevin, I know that feeling that you will somehow lose your hostas by dividing them — even though I can never remember a single such loss. 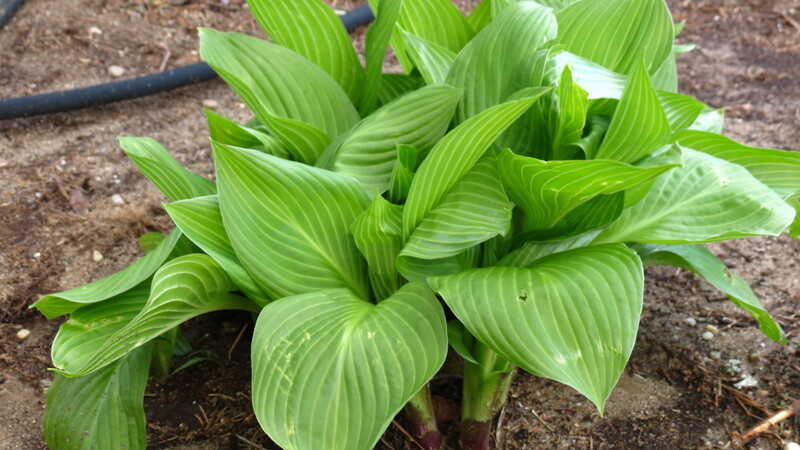 In fact, my original hostas, which came from my parents’ back yard, sat in a cardboard box by my back steps for weeks before I got around to sticking them in the ground. “Sticking” is the right verb here, since I put them in unamended sandy soil in full sun. (I was clueless!) More than 20 years later, they are thriving and need to be divided every few years. What a daunting task. Good for you for getting out there and doing it. Nicole, it was stressful — but all of the patients survived. Thanks for commenting!